As the staff member responsible for coordinating our volunteer efforts, I get a front row seat each day to the ways volunteers are helping Literacy KC work toward our mission of Literacy for All. Our volunteers are involved with many different aspects of the organization (see chart below), ranging from tutoring in our classes and helping in the computer lab to cutting flashcards and scanning student files. It is truly inspiring to come into work each day and watch as they interact with students and cheer them along as they achieve their educational goals. A breakdown of the services provided by Literacy KC volunteers. The volunteers at Literacy KC are making HUGE contributions to our organization. In the last fiscal year, Literacy KC had over 8,100 volunteer hours served! According to The Independent Sector’s rates for volunteer time, this is equivalent to over $190,000 worth of work. In terms of employees, our volunteers log more hours than 5 full-time workers would. These numbers mean a great deal to Literacy KC and they reinforce what we already know: that our volunteers are some of the most generous and dedicated in Kansas City. Volunteers are an integral part of our team and without them we would be unable to offer the depth of services that our students need and deserve. From all of us at Literacy KC, we’d like to say thank you to our amazing volunteers! Carrie, Clara & Jane are referred to as “The Librarians” as they are commonly tasked with arranging our library. Want to join the fun and volunteer with Literacy KC? Contact Kate Brown at kbrown@literacykc.org,visit literacykc.org, or call our office at (816)333-9332. In the past, we sat down with Janice, one of our volunteers, to talk about her involvement with Literacy KC. This time, we sat down with one of our employees, Rachel Henderson, to get a staff perspective on Literacy KC! Rachel Henderson is the Programs Support Coordinator and is responsible for supporting the AmeriCorps VISTA projects and the Ticket to Read program, along with the other programs. Rachel, during her AmeriCorps VISTA year, at the Zoo with Operations Manager Kim Rogers in 2015. Before you got hired on as a full time employee, you served as an AmeriCorps VISTA for Literacy KC for a year. What did you do during that time? I previously served as the Ticket to Read Program Coordinator VISTA in 2015. During my time as TTR Program Coordinator, I was able to see the initial launch of the classroom model from our previous one-on-one tutoring model, develop and implement systems to ensure program sustainability (such as class rosters, goals, and reporting measures), and was fortunate enough to build strong relationships with our students. What is it that brought you back to work for Literacy KC as a full time employee? This truly is a great organization to work for and it stands behind a great mission. Along with the amazing staff, volunteers, and donors that we have, I came back for our students. The commitment that our students have in improving their literacy skills and making time to better themselves in light of everything that may be going on in their lives is truly aspiring. I appreciate working somewhere that is bigger than myself, where I have the opportunity to serve others. What is your favorite part about working for Literacy KC? My favorite part about working for Literacy KC is the students. What are some things that set Literacy KC apart from other organizations? What about working at Literacy KC is so special? Our focus is on the success of our students and I think that is truly special. We aren’t focused on doing things that are great for us individually or as a business; I truly believe that every action taken by Literacy KC is to benefit the students. Every person involved with our organization has a heart as big as the sky and that shows in our day-to-day operations. That sets us apart from other organizations and is rare to find! What is the biggest challenge you face when it comes to working for an organization that deals with adult literacy? The biggest issue that I see when it comes to working or dealing with adult literacy is the need for more support and resources. While children may be tomorrow’s future, today’s adults have to help our children get there. When we are not able to provide the adults with the resources they need to improve their literacy, which we hope they will pass to their children, then a systematic issue of low-literacy develops in the community. We are very happy to have Rachel back on the Literacy KC team! If you could describe Literacy KC in one word, what would that word be and why? Dedicated. Literacy KC is a dedicated and devoted group of staff, volunteers, partners, and donors. Our students are willing to go the distance to seek and be the change in the future our community. Tell us one interesting fact about you or something people may not know about you. I really enjoying listening to country music. My favorite country song is “BBQ Stain” by Tim McGraw. I also love artists like Rascal Flatts, Shania Twain, Dixie Chicks, the list could go on and on, but I love a good country song! Is there anything else that you would like people to know about Literacy KC? Anything else you want to add? I could not be more happy to reunite with such a driven organization that is revolutionizing the future of adult literacy in Kansas City. My door is always open for a good laugh, conversation, anything. Come visit me anytime! The fall session of Literacy KC’s Ticket to Read (TTR) classes began September 8. As the AmeriCorps VISTA volunteer assigned to coordinate this program for a year, I’m looking forward to sharing my viewpoint about classes, students, events, and the personal stories of success and accomplishment the TTR program is designed to help achieve. It is essential to me that we maintain the individuality of each of our students, so I will be authoring several of the upcoming Student Stories. My first two weeks as a VISTA have been quite eventful! The process of joining the staff was impressively efficient for the amount of information that had to be handled in a short period of time. My co-VISTA, Lindsey Clark, and I jumped right into the enrollment process, both for new and returning students. This involved a good deal of preparation, both of physical materials (tests, pencils, information handouts) and online data entry, but the payoff was absolutely worth all our efforts. Over the course of the first week I met more than one hundred truly incredible people from all over Kansas City eager to improve their literacy. I met old married couples who had committed themselves to learning to read better together; young men determined to be outstanding fathers; one man very recently from Liberia and his fantastic (and energetic) wife; a dyslexic woman with an inspirational level of confidence despite her past setbacks; and so many more wonderful people. Our second week featured the beginning of the new students’ Digital Life Skills (DLS) classes. A major aspect of TTR is the promotion of digital literacy, as job success relies heavily on the ability to use and interact with the Internet. The DLS classes, held in our computer lab (generously donated to us by Google Fiber), gave me the first opportunity to meet many of our new students in a group educational setting. We also continued to reach out to several of our returning students; these were people who had been valuable members of our classes and community, and we were lucky enough to re-enroll many of them, ensuring their continued success (and making the LKC staff very happy!). As the term moves into full swing, my role as TTR program coordinator will begin to take on more of the responsibilities I’ve been tasked with as a VISTA. Student Coordinator Emily Hane and I have already discussed several long-term goals for my year here, which include the streamlining of our data-entry process (particularly of students’ goals) and the inclusion of more start dates for classes throughout the term, giving students more flexible scheduling. Now that fall classes have begun, I will be able to work directly with both executives and instructors to maximize the potential of the Ticket to Read program. Keep reading here weekly, because TTR is headed to some exciting places! 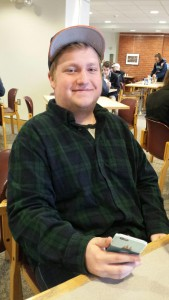 Will Orlowski joined Literacy Kansas City in August 2015 as an Americorps VISTA. As a VISTA (Volunteer In Service to America) Will is tasked with combating poverty and expanding Literacy Kansas City’s capacity to serve the Kansas City community. Prior to joining Literacy Kansas City, Will graduated with a BA in English Creative Writing from the University of Kansas. He writes poetry and fiction, and has lived in Denver, Houston, New York, Oklahoma City, Lawrence, and Kansas City. Will is an accomplished writer and has over six years of experience in customer service. He was also the Education Officer of his music fraternity, Phi Mu Alpha, for three years while at KU. Will is an avid sports fan, a passionate Jayhawk, a lover of all things literacy, and truly excited to be a part of Literacy Kansas City.